There are certain niches in modern gaming that those of us retro fans love to see. When, in an ever-evolving industry, a developer takes the time to create a homage to video gaming’s roots, us retrophiles reciprocate with nothing but praise and approval. The Nintendo 3DS has seen quite a few throwbacks to the 8-bit era, from its GameBoy Virtual Console titles to the enhanced 3D Classics; wonderful revisits of gems years past launch. But it is when developers create entirely original games that us retroactively-inclined truly get giddy. 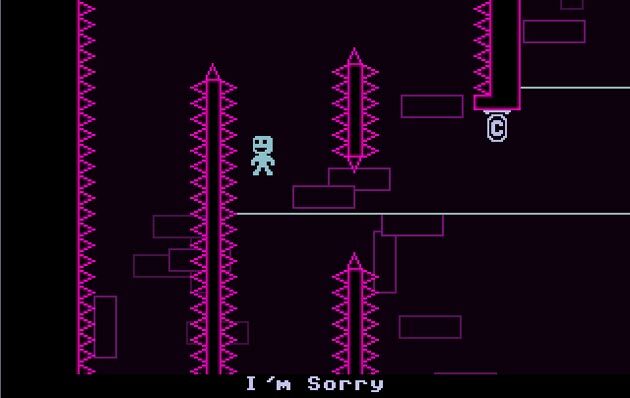 VVVVVV is one such game. 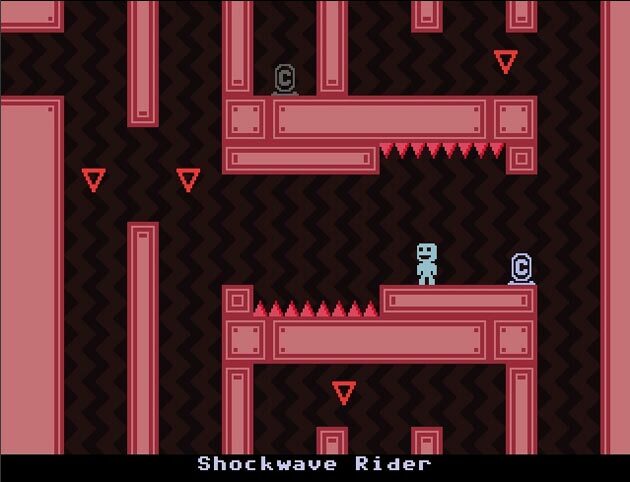 First off, let me correct one thing: the 3DS edition of VVVVVV is a port. It was originally released on the PC in 2010 by indie developer Terry Cavanagh, and was met with moderate success. In late 2011, it was brought to the 3DS eShop, courtesy of publisher Nicalis (Cave Story). VVVVVV performs well enough on the 3D screen. The effect is somewhat subtle, even with the 3D slider on full. The graphical style is equivalent to what you might find on an Atari 5200; the gamer who takes modern graphics with the utmost importance, this style will come off as purely unappealing. But then, this is a game that doesn’t try to be what it’s not. 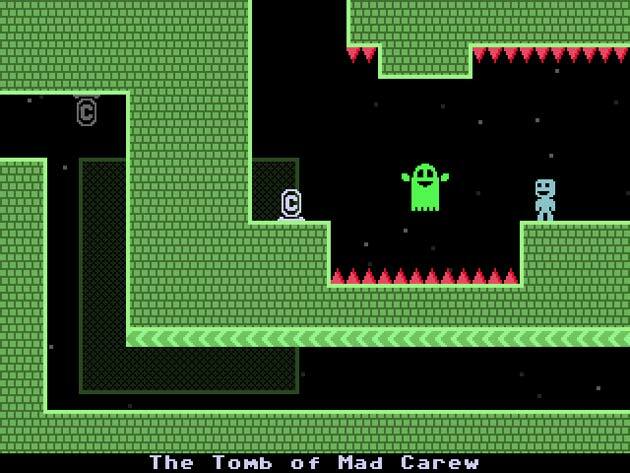 VVVVVV was created as a throwback to the early days of gaming, and does wonderfully well in that regard. In fact, each character has only two face sprites; when your character takes damage they frown, otherwise they feature an enormous, cutesy grin. 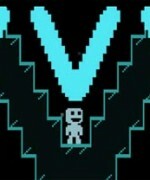 Through the 3DS’s crisp speakers, VVVVVV’s retro soundtrack resonates beautifully. The glorious beeps and MIDI tunes of the 80’s provide this game with the eclectic, sci-fi soundtrack it demands. In particular, the music accompanying the overworld leaves me with a number of emotions. It speaks of adventuring into the unknown, yet at the same time suggesting a homey familiarity—one born of the oldschool nature of the game. What you’ll notice right away is that this game does not take itself too seriously. It features a sort of endearing tongue-in-cheek humor that is present throughout the entirety of the game. You control captain Viridian, a starship hero whose vessel has crashed into an unknown dimension, leaving the captain alone and his crew scattered. Progress in VVVVVV is measured by each crew member you find; there are 5 missing in total. This would suggest a somewhat shorter playtime, and that is sorely the case. I cleared the game in a matter of 3 hours, albeit not in one sitting. However, bundled into the 3DS edition is the option to activate a number of modes. From fan-created dimensions to a completely mirrored original adventure, there is plenty to do after the initial playthrough is complete. In addition, there are 20 Trinkets you can find (humorously referred to in-game as Trinkets), which range from easily obtained to near-impossible to get to. Gameplay is both simple and unique. There are only two actions Viridian can make the entire game; running and jumping. Jumping, in this game’s context, means switching from standing on the floor to standing upside down on the ceiling. There is apparently no gravity in this strange dimension, and every jump switches your position. This makes for some of the hardest obstacles in modern gaming history. Let me repeat that; the difficulty of this game is not for the feint of heart. It is the definition of Nintendo-hard. Viridian is a one-hit wonder, and there are many spikes and obstacles that would do him in. To counterbalance this, you have infinite lives. In fact, again in the humor this game is so great at putting out there, the Pause menu keeps track of your deaths. True story. This reviewer is at 972, personally. The enemies you run into can’t be harmed; you simply must avoid them. 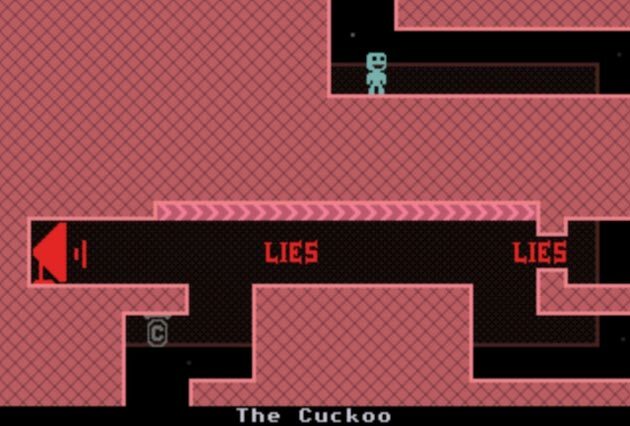 All in all, VVVVVV is a wonderful addition to the 3DS’s ever-growing library. Fans of retro-styled games, this one’s for you. Those who prefer modern gaming might want to steer clear, and to those who have played this on its original home, you won’t find much new. Hehe…looks like Pacman crossed with Mario Bros crossed with Bomber Man! Really cool would love to play! I never used MIDI while creating the soundtrack, but glad you appreciate it nonetheless!